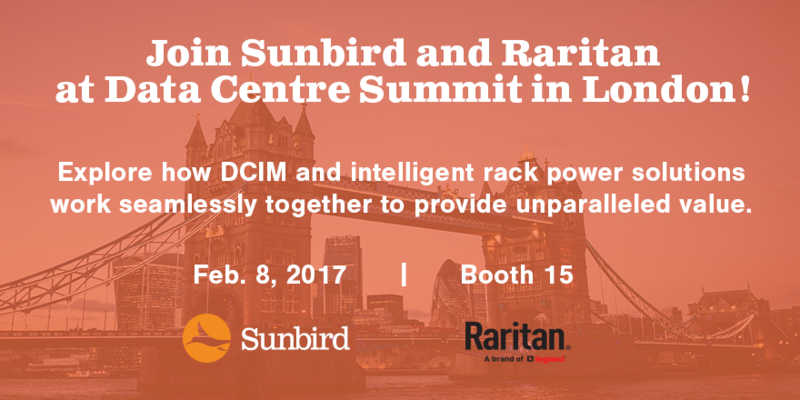 Sunbird is excited to be participating with our strategic alliance partner Raritan, Inc. at Data Centre Summit at the Barbican Exhibition Halls in London, UK, on Wednesday, February 8, 2017. Come find us at Booth 15 to meet with our DCIM experts and get a first look at the new features in the latest release of our Data Center Infrastructure Management (DCIM) software. Data Centre Summit will help attendees keep up to date with the newest technologies in the industry. Featuring a line-up of industry thought leaders, there will be many valuable seminars for attendees throughout the day. This will be a great day to meet up with like-minded data center professionals and learn from their experiences with optimizing their data centers! During Data Centre Summit in London, Sunbird and Raritan will be demonstrating how DCIM software can truly add value to Raritan’s multiple, award-winning rack power solutions and make it easy to manage your data center environment today and into the future. This one-day conference for data center professionals in the heart of London will bring together some of the industry’s leading experts under one roof. You won’t want to miss this event! Heading to Data Centre Summit and want to chat one-on-one with a DCIM expert? Sunbird representatives will be available for individual meetings to help you find out if DCIM is right for you. Let us know if you’d like to meet for a personalized demo.